1.In food processor with knife blade attached, add green onions, garlic, spinach, oils and tarragon. Process 1 minute or until mixture is smooth, scraping bowl occasionally with rubber spatula. 2.Add mayonnaise, mustard, lemon juice, salt and pepper, and process 30 seconds or until well combined. 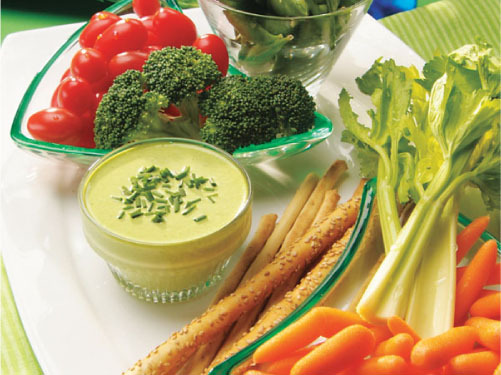 3.Sprinkle dip with chives and serve with fresh vegetables. Other veggie suggestions: cauliflower florets, sliced bell peppers (red, green, yellow, orange), radishes, mushrooms, blanched asparagus spears. This dip also tastes great with breadsticks or crackers. Serving Tip: Cut a thin slice from the bottom of a red pepper to create a flat surface for pepper. Carefully cut off 1 inch from the top of the pepper. Remove the membranes and seeds from the inside without cutting through the pepper. Fill pepper with dip and garnish with chives.